I’m a big proponent of traveling in the off-season, so what better time to visit Scotland than late February? My husband recently traveled to England and Scotland for work, and I tagged along for the second half of the trip. We spent 10 days in southern Scotland, devoting most of our time to Edinburgh. While we did trek over to St. Andrews for a few hours and spent a day in Glasgow, Edinburgh’s sites were the highlight of the trip. 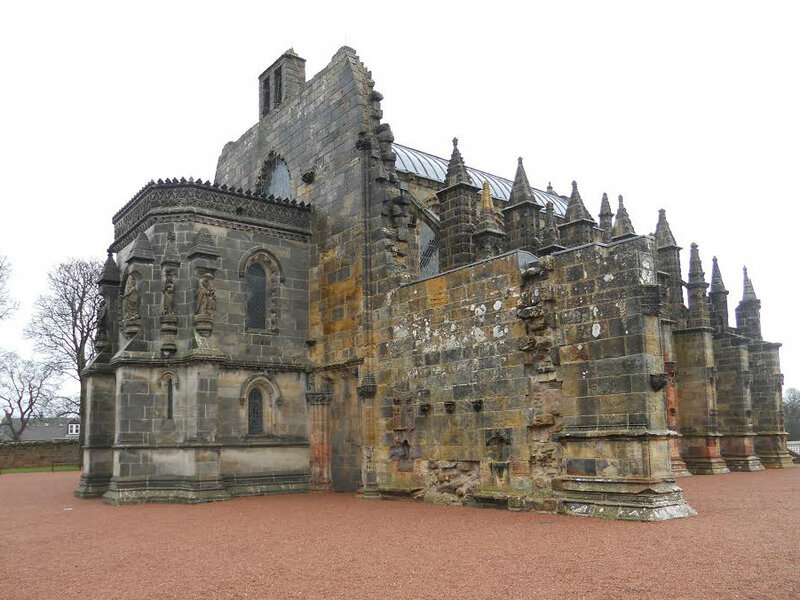 I’ve included some pictures in this post, but many places, including the Palace of Holyroodhouse and Rosslyn Chapel, don’t allow photographs. Churches and jails are my favorite places to visit. In my mind, no other buildings tell history in the way these structures do. They represent the best and the worst of people—and Edinburgh Castle, Scotland’s most famous tourist attraction, has both. Along with Scotland’s Crown Jewels, the Mons Meg, a massive cannon that was a gift to King James II, and the Great Hall, with its beautiful hammer beam roof. The Castle sits on a hill overlooking Edinburgh and has served many purposes since it was built in the 11th century, including as a Royal home and military headquarters. To me, it’s not as interesting as The Tower of London, but still well worth the visit. The Prisons of War exhibit highlights the conditions of foreign prisoners who were held captive at the Castle. And another exhibit shows what life was like for Scotland’s soldiers sentenced to serve time for minor crimes, such as being intoxicated while on duty. There are also several museums dedicated to Scotland’s military—I found these less interesting, though the dress uniforms (including kilts) worn by Scotsmen over the years are pretty neat. The tiny St. Margaret’s Chapel, built in the 12th century, is the oldest building in Scotland. The English Margaret and her family fled to Scotland after the Norman Conquest, but the chapel was not built until the reign of Margaret’s son, David I. In the 14th century, Robert the Bruce captured the Castle and destroyed all the buildings except the chapel, later ordering that money be set aside for its upkeep. The chapel’s small, stained-glass windows feature St. Margaret, three other saints, and William Wallace. We spent about 3 hours at the Castle, though you could spend a whole day and still not see everything. I’d recommend buying your tickets in advance or getting in line early. We were there when the gate opened and the Castle wasn’t too crowded, but by the time we left, scores of people were waiting in line to get in. Though it’s hardly a hidden gem, the Palace of Holyroodhouse doesn’t get nearly the attention it deserves. Everyone goes to Edinburgh to see the Castle, but the Palace offers an interesting glimpse into the life of Scottish royals (before the crowns of England and Scotland were united) and serves as the present-day Scottish residence of Queen Elizabeth. I went early in the morning and essentially had the place to myself. I wandered through the dining room, the throne room, several drawing rooms, and the Great Gallery, which features paintings of the Scottish line—paintings that, suspiciously, look like the same person is different period dress. 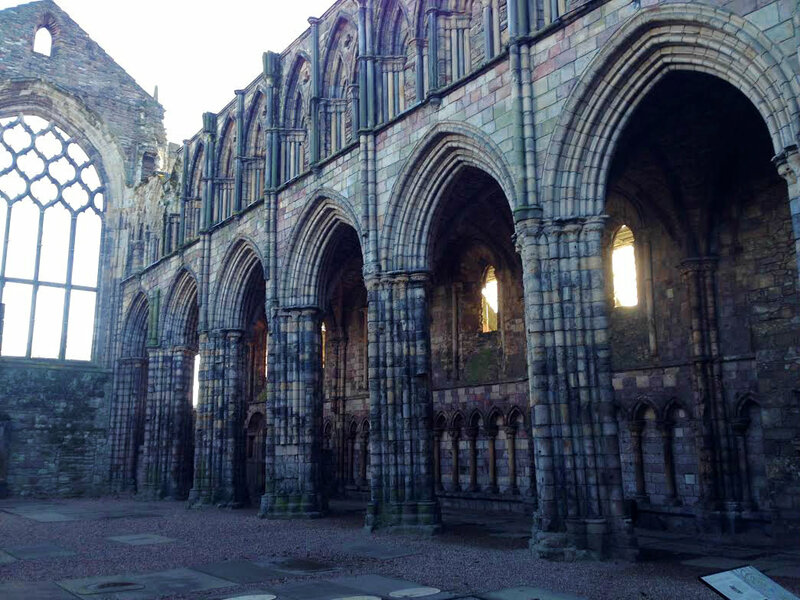 The remains of Holyrood Abbey, which was first used as a place of worship in 1128. 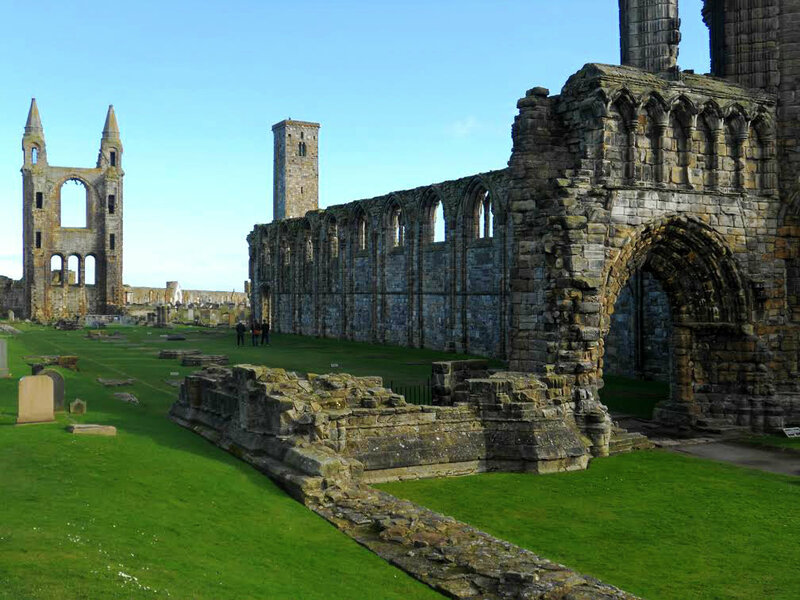 The roof collapsed in 1768 and was never repaired, leaving the abbey open to the elements. For the uninitiated, Rosslyn is the church from The Da Vinci Code. Rosslyn was famous long before Dan Brown decided to make it the setting for the Da Vinci denouement, but I can understand why Brown chose it, because Rosslyn is unlike any other church I’ve ever seen. The Chapel is small, but well worth the hefty (£9) entry fee. Rosslyn is filled with mysterious and fascinating carvings and symbols. More than 100 green men (a symbol of nature and fertility) can be found inside, along with a carving of Moses with horns (an apparent mistranslation of Hebrew), and the faces of the Chapel’s master mason and his apprentice, who was killed by the master mason in a fit of rage. Knights and angels line the walls; stars, daisies, and other flowers float overhead; and Lucifer, bound in rope, hangs upside down in the Lady Chapel. Mysteriously the Chapel also contains carvings that appear to be corn and aloe plants—which were unknown to Europeans when the Chapel was built, years before Columbus made his journey across the Atlantic. Rosslyn is the place to go if you love conspiracy theories. The Chapel is said to house the treasures of the Knights Templar—which might include everything from the Holy Grail to the mummified head of Jesus or John the Baptist. Others think Rosslyn’s carvings represent a musical code or reveal the secrets of the Freemasons. We looked hard for these treasures, but never found them. Even if you aren’t a conspiracy theorist, the Chapel and its carvings are unique and mysterious, making Rosslyn well worth the short trip from Edinburgh. St. Giles Cathedral, the High Kirk of Edinburgh, is named after the patron saint of the city. The cathedral is rather non-descript, but the Thistle Chapel, in the right, rear corner of the church, features amazing woodwork, including a bagpiping angel. 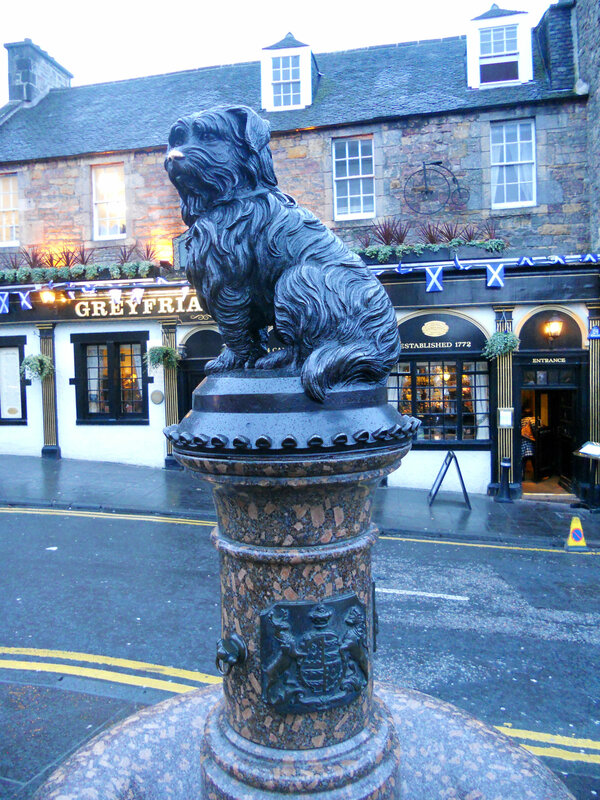 Greyfriar’s churchyard holds the gravestone of Greyfriar’s Bobby, a little dog who—if the stories are true—lived in the churchyard for 10 years after his master died and was buried there. Visitors leave sticks on Bobby’s grave and take pictures with his statue, which is across Candlemaker Row from the Greyfriar’s entrance. Ghost tours are popular in Edinburgh, supposedly the most haunted city in Europe. We enjoyed a fun, not-too-scary Mercat Tour, which took us around the city center and into the haunted Blair Street vaults. We found live Scottish music in many different pubs, including Sandy Bell’s and The Rabbie Burns. On weekends, bagpipers hoping to make a few pounds in tips dot High Street and the area near the Castle. What do you you want to visit most in Edinburgh? This guest post was penned by Megan Boyd. Megan is an attorney and legal writing professor living in Atlanta, GA. Please visit her blog, Lady Legal Writer. What a great time of year to go … no crowds of tourists! How was the weather? I was there in January before I headed up to Shetland. Loved it. I too prefer traveling in the off season but I would like to go back and see Edinburgh in the summer. The Greyfriar’s pub in the picture had a great dinner deal during Burns Night. I ate there a couple of times. I also did the Mercat tour but it was way too cold for me to truly enjoy. Note to self, wear warmer gloves. Sandy Bell’s! I lived in Edinburgh for three years and this was the best little pub for traditional live music and a great Whisky selection. Great post! I think Edinburgh is gorgeous year round, but I loved being there in the winter. The tourists stay away and everything looks amazing on a cold, clear day. I love traveling in the off-season as well. I visited Scotland & Edinburgh in March and late October and both times it was great. Reasonable prices, no big crowds, decent weather. Also, the city has become a favorite of mine. Such a lovely place! Yes – off-season travel is especially fantastic when you luck out with great weather as well! Great post. We missed the Rosslyn Chapel, but saw the other highlights you list here. We even did a ghost tour! Wondering how the weather was during February? We visited in early June, and it was a little rainy but generally warm. We’re thinking of a return visit during February and wonder how cold it felt. B Smith recently posted…Taking 4 Boys to Austenland – Sense & Sensibility?